This is why it is so important that beyond liturgical "aestheticism" or rigid "rubricism," we recover the real meaning of the liturgical time, described in such a simple way in the Typikon. It is here that the Church has concealed the treasure of her love, of her wisdom, of her "practical" knowledge of God. The liturgy of the Church must be liberated from a trivial "schedule of services" and become again what essentially it is: the sanctification of time and in it of the whole life, by the presence of Christ. Only such a liturgy does not divide the life of a Christian into two lives, the one "sacred" and the other "profane," but transfigures the one by the other, making the whole existence a confession of Christ. For Christ did not come in order that we "symbolize" His presence but in order to transform and save the world by His presence. 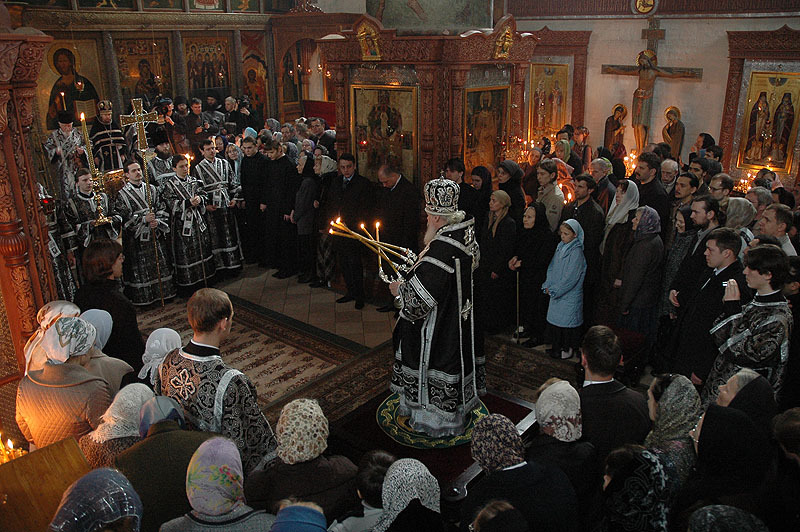 The liturgical rules of the Orthodox Church prescribe that the Divine Liturgy is to be celebrated after Vespers on certain fast days. These days are: Thursday and Saturday of the Holy Week, the eves of Christmas and Theophany and the Feast of the Annunciation. Likewise the Liturgy of the Presanctified Gifts is always celebrated after Vespers. If we bear in mind that our Typikon determines the time for Vespers according to the sun and not by the clock, then the prescribed time for these evening Liturgies should be approximately from two to five in the afternoon. It is well known that these rubrics have become dead letter today, or rather they are preserved in form, but in such a way that the Liturgy is not transferred to the evening, but on the contrary, Vespers is served in the morning. This breach of rule should not be explained as a mere condescension of the Church to the “weakness of the flesh,” as a desire to curtail the period of abstinence for the communicants, for we can observe this same practice where the rubrics are scrupulously respected and where no attempt is made to defer to human weakness. In this case, we are forced to deal with the belief, deeply rooted in contemporary ecclesiastical consciousness, that the Divine Liturgy must always be celebrated in the morning. Its vesperal celebration would appear to be an unheard of innovation to the overwhelming majority of Orthodox people, something much more unnatural and irregular than the well-established practice of serving Vespers in the morning and Matins in the evening. It is obvious however, that in uniting the Liturgy with Vespers, the authors of the Typikon intended more than a purely formal connection between the two services. They meant a deliberate transfer of the Liturgy to the evening, a conscious change in the usual order of services. Again it is obvious that in not fulfilling the rule, or in fulfilling it only as a formality (i.e., in transferring Vespers to the morning) we commit a twofold infraction of the liturgical “typos”; we serve an evening service in the morning which besides being a “nominalization” of prayer, is a contradiction to the common sense, and moreover, we completely ignore the reasons which promoted the Church to order the celebration of the Liturgy on certain days in the evening and not in the morning. But perhaps if we investigate these reasons, we will see in them something more meaningful than a mere detail of rubrics, something forgotten yet essential for the comprehension of our liturgical tradition. The most general explanation is to be found in the Typikon itself. Chapter 8 contains the following instructions: “on Sunday ye shall begin the Liturgy at the start of the third hour (9 o’clock A.M.), so that the time of breaking fast shall come at the start of the fourth hour; on Saturday ye shall begin the Liturgy at the start of the fourth hour, so that the time of breaking fast shall come at the start of the fifth hour; on lesser holidays and other days, begin at the fifth hour so that the time of breaking fast shall come at the sixth hour.” We have thus a definite relationship between the time (“kairos”) of the Eucharist and the fast, which is to precede it. This “eucharistic fast” must be lengthened or shortened depending on the nature of the day, on which the Liturgy is celebrated. The Typikon considers it self-evident that Divine Liturgy is always preceded by strict abstinence, therefore the general sense of all these instructions is that the greater the holiday, the earlier is the Liturgy celebrated and hence the shorter is the period of abstinence. Let us note in passing, that here too our modern practice clearly contradicts the rubric: we tend to consider a late service more “fitting” for a great holiday, and an early one is “good enough” for every day. The directions of the Typikon might, at first glance, appear to be simple relics of some ancient monastic rule which for some inscrutable reason keep on being repeated from one edition of the Typikon to another. However, if we make an effort to “translate” these dry instructions, we will find in them a whole theology of fasting in its relationship to the Liturgy. Having understood this, we may question and decide whether it is conditional, relative, and pertaining to the past or whether it contains an element of Tradition binding us as well. To discover this is to understand that in these instructions has been concealed the concept of fast, its living experience whose origin is in the Gospel itself, and which, from the very beginning, was received by the Church. In these externally legalistic and almost trivial regulations, it is fashionable today to consider their observance a mere ritualism and pedantry, incompatible with our modern “way of life,” there is revealed a profound understanding of human life in its relation to Christ and the Church. This we will now briefly attempt to set forth. According to the Synoptics, the Pharisees accused the disciples of Christ of not fasting (whereas they and the disciples of John “fasted greatly”). To this, Christ answered, “Can the wedding guests fast as long as the Bridegroom is with them? As long as the Bridegroom is with them they cannot fast. But the days will come when the Bridegroom will be taken away from them, and they will fast in those days” (Mark 2:18; Luke 5: 33; Mt. 9:14). These texts stress the connection between fasting and the Messianic service of Christ, but it becomes impossible in the joy of His Presence. More generally, fasting is the expression of expectation, of the state of waiting and preparation. Thus, Christ contrasts Himself to John the Baptist: “For John the Baptist came neither eating bread nor drinking wine . . . The Son of Man has come. He eats and drinks. . .” John the Baptist in this context is the “type,” the symbol of the Old Testament in its relation to the New Testament. The Old Testament is the time of preparation and expectation and it comes to its end with the apparition of the Faster. But the Son of Man “eats and drinks” and His disciples also eat and drink and in the Gospel we constantly see the Lord breaking bread with the publicans and sinners in the homes of the Pharisees and also providing food to the multitude of men. For in Christ and with Christ is revealed and comes the Kingdom. And in biblical typology, the Kingdom is often represented as a banquet, as the breaking of fast. (cf. for example, Isa. 25:6). And it is this Scriptural teaching about fast, the Christological and messianic context of fasting that defined the place and the “function” of fasting in the Church from its very beginning. On the one hand, the Church is herself the beginning, the eschatological anticipation of the Kingdom. The Bridegroom is present and His presence is revealed in the breaking of bread, in the eucharistic banquet, which is the sacramental anticipation of the fullness of the Kingdom, of the Messianic banquet. In the Book of Acts, the “breaking of bread” is the essential fact that builds up the “ecclesia,” the Messianic community. (Acts 2:42). In this assembly, in the “koinonia,” there is no room for fasting: the expectation has come to an end, the Lord is present, “maranatha.” He has come, He is coming, He shall come . . . But, on the other hand, with the Ascension of Christ, a new period of expectation has begun: expectation of the “parousia,” of the second glorious advent of Christ, of the fulfillment in which “God shall be revealed as all in all.” The Lord has triumphed and is glorified, set the history of “this world” is not yet achieved, it awaits its consummation and judgment. Whereas the history of the Old Testament was directed at the coming of the Messiah, the history of the New Testament is directed at the return of the Lord in His glory and the end of the world. That which the Church has and acknowledges in the “mysterion” already, will become evident at the end of this world. And inasmuch as the Church is still in “statu viae” and Christians are still living in this world, they expect, they wait for, this “parousia,” they pray and keep the vigil for they do not know when the Son of Man shall come. And this expectation is expressed therefore in a new fasting, in a new state of awaiting. This expectation, this yearning, is now constantly fulfilled and answered in the sacrament of the Lord’s Presence, in the Eucharistic banquet. Living in time, in history, the Church reveals already the triumph of eternity, anticipates the glory of the Kingdom which is “to come.” And this “fast — expectation” finds its consummation in the Sacrament, when in the same and eternal commemoration we represent, i.e., make present and real, both the first coming of Christ and His “parousia.” Thus, fasting and Eucharist form, so to say, two complimentary and necessary poles of Church life, manifest the essential antinomy of her nature: expectation and possession, fullness and growth, eschatology and history. These considerations give us the key to the “technical” rules of the Typikon, fill them with spiritual meaning. They express the essential liturgical principle of the incompatibility of the Eucharist with fasting: the Eucharist cannot and must not be celebrated on a day of fasting. Being the sacrament of Christ’s presence, the Eucharist is the feast of the Church, or even more, the Eucharist is the Church as Feast, and consequently the measure and the context of all feasts. For a feast is not a mere “remembrance” of such or such an event of the earthly life of Christ, but precisely the reality of His presence in the Church by the Holy Spirit. And therefore whatever event or person are commemorated in a feast, this commemoration necessarily finds its fulfillment in the Eucharist, in the “mysterion” which transforms remembrance into presence. The Eucharist manifests the link between all particular events, all the saints, all the theological affirmations with the saving work of Christ. 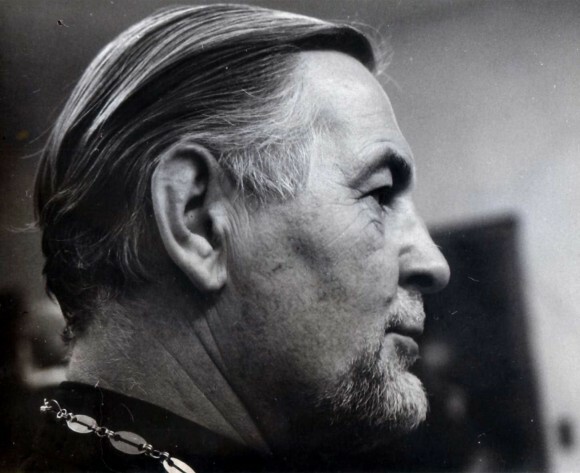 Whatever we commemorate, whatever we celebrate, we always discover – and this discovery is made in the Divine Liturgy – that in the Church everything has its beginning in Jesus Christ and everything has in Him its end, its fulfillment. We can note here that the Orthodox Church has never accepted the principle of a non-festive Eucharist, similar to the Roman “low Mass.” For a long period, the Eucharist was an essentially dominical cult because it is always Paschal by its very nature, it always announces the death of Christ and confesses or bears witness to His Resurrection. A second principle necessarily follows the first. It is that of fasting period, which must precede every Eucharistic celebration. Expectation must precede fulfillment. From this point of view, the eucharistic fast is not a simple abstinence before communion, it is made primarily of expectation and spiritual preparation. It is fasting in the scriptural sense indicated above, the waiting for the sacramental Parousia. In the early Church, the Sunday celebration of the Eucharist was preceded by a night vigil which was precisely (and theoretically still is in the Eastern Church) the service of preparation and getting ready, a vigil in the full Christian meaning of the word. And this is why the Eucharist on Sunday and on great holidays is prescribed for the early hours of the day: it is the fulfillment, the end of the vigil, of the service of fasting and preparation. But on a lesser feast, which has no vigil, the celebration of the Eucharist takes place at the end of morning, for in this case, the morning hours of fasting constitute the necessary period of preparation. Thus the whole liturgical life of the Church which, in turn determine the life of each member of the Church, is built on this rhythm of expectation and fulfillment, preparation and “presence.” And the rules that govern this rhythm cease to be archaic and incomprehensible but become signs of a path leading us to the very heart of life in the Church. According to the Bible, it is through food that Satan conquered man and became his master. Man has tasted of the forbidden fruit, and in doing so has become enslaved to food, so that his whole existence depends on it. This is why fasting, in this biblical perspective, is not to be equated with a mere moderation in eating, with a kind of elementary hygiene. The genuine fast, the true abstinence, the one which the Church glorifies in her holy “fasters,” is indeed a challenge to the so called laws of nature and through them to Satan himself. For nothing hurts him more, nothing destroys his power more than this transcending by man of the laws, of which he has convinced man that they are “natural” and “absolute.” Without food man dies therefore his life depends entirely on food. And yet by fasting, i.e., by refusing voluntarily food man discovers that he lives not by bread alone. And then fasting becomes the denial of what has become “necessary,” the real mortification of that flesh which depends entirely and exclusively on the “unescapable laws of nature.” In fast, man reaches that freedom which he has lost in sin, recovers in the cosmos the Kingship he had annihilated by transgressing the will of God. Fasting is a free return to the fulfillment of that commandment which Adam has transgressed. Accepting it, man again receives food as a Divine gift, food ceases to be a “necessity” and becomes the very image of the messianic banquet, for “eat in order to live” has become again “live in God.” This idea of fasting rooted in Christ’s forty days of fasting and His encounter with Satan, is the foundation of the ascetical fast, which one must distinguish (but not separate) from the eucharistic fast, defined above as a state of preparation and expectation. Nothing can better show the relationship between these two aspects or functions of fasting than Lent and its liturgical particularities. On the one hand, Sundays and Saturdays, being essentially days of Eucharist, are “liturgically” excluded from Lenten fasting. They have none of the distinctive liturgical marks of “fasting” days. The eucharistic fast is always limited by the rhythm of the Eucharist itself, its limit being the Liturgy to which it is related as preparation to fulfillment. It is achieved and accomplished in the reception of the eucharistic food. The eucharistic fast is thus a function of the Church, for it corresponds to a state of the Church herself. The ascetical fast, on the other hand, is first of all individual, being a personal accomplishment in the Church. The regulations concerning this fasting, which differ according to various local traditions, are relative in the sense that they are primarily indications of a well established method, a sure guidance, but not an absolute teaching of the Church. These rules depend on the climate, on the way of life in a given sociological context, on external conditions etc. The orders to eat figs on such day and beans on another, orders that we still find in the Typikon, obviously cannot be accepted literally, or considered as “absolute.” The important thing here is to understand that the eucharistic fast is the fast of the Church, while the ascetical fast is the fast of a Christian in the Church. The latter is determined by the nature of man, the former by the nature of the Church. Thus if during Lent, the eucharistic fast finds its conclusion every Sunday in the eschatological fullness of the Sacrament, the ascetical fast is not interrupted, for multisecular experience proves that its spiritual fruits ripen slowly and require a long and sustained effort. Between them however, there is no contradiction. 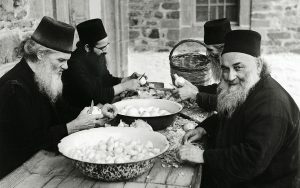 A monastic dinner on a Lenten Sunday must be “meager” as to its alimentary quality and quantity; it is nevertheless a Sunday dinner, a breaking of fast, for following the Eucharist and the eucharistic fast, it belongs spiritually to the experience of joy and fullness which is the substance of the Christian Sunday. It is impossible to indicate here all the theological implications of fasting as it is described and prescribed in our liturgical tradition. We can only point to its essential significance. The Church lives on two levels, has two “states.” She is waiting for, but she also possesses already, the object of expectation. In time, in history, she is not only “in via,” on her way to the Kingdom, but also the manifestation of this Kingdom. And the meaning of her life is that these two “states” are not separated from each other, do not oppose each other in a radical contradiction. Each of them is founded in the other and is impossible without it. Eternity does not empty or make absurd and meaningless either time or our life in time, but on the contrary gives them all their weight, all their real value. The Church fills with an eternal truth, with reality which she alone possesses, the apparently meaningless flow of time. The rhythm of the Church, the rhythm of the Eucharist which comes and is always to come, fills everything with meaning, puts all things to their real place. Christians do not remain passive between one celebration and the next one, their “temporal” life is not empty, is not “diminished” by eschatology. For it is precisely the liturgical “eschaton” that ascribes real value to every moment of our life, in which everything is now judged, evaluated and understood in the light of the Kingdom of God, the ultimate end and the meaning of all that exists. 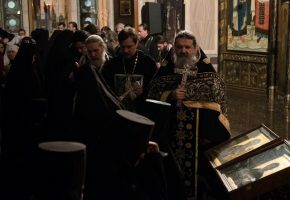 There is nothing more alien to the true spirit of Orthodox liturgy than a certain superstitious “liturgiologism,” or an “eschatologism” which reduces the whole Christian life to communion and despises everything else as “vain.” Such liturgical “piety” does not realize that the true significance of the Eucharist is precisely that of judgment, of transformation, of making infinitely important, the whole life. For the Eucharist bears witness to the Incarnation, and since it has been coordinated with time, introduced into time, time itself and each one of the moments in time are filled with meaning, acquire a significance in relation with Christ. Indeed, all the things of life, small and great, have ceased to be an end and a value in themselves, yet it is not in such isolation and self centeredness that they were truly “absurd”? But now, understood in the perspective of the Kingdom, all of them can and must become signs and means of its coming, “instruments” of the world’s salvation in Christ. This is why it is so important that beyond liturgical “aestheticism” or rigid “rubricism,” we recover the real meaning of the liturgical time, described in such a simple way in the Typikon. It is here that the Church has concealed the treasure of her love, of her wisdom, of her “practical” knowledge of God. The liturgy of the Church must be liberated from a trivial “schedule of services” and become again what essentially it is: the sanctification of time and in it of the whole life, by the presence of Christ. Only such a liturgy does not divide the life of a Christian into two lives, the one “sacred” and the other “profane,” but transfigures the one by the other, making the whole existence a confession of Christ. For Christ did not come in order that we “symbolize” His presence but in order to transform and save the world by His presence. We must understand that the liturgy of the Church is profoundly realistic, that Vespers is in a real rapport with this particular evening: it is this evening that we as Christians must spend “perfectly, in holiness, in peace and without sin,” it is this evening that must offer and dedicate to God, and this evening is already illumined for us with the light of another Evening, of another End, the one which we expect and at the same time fear, and which is approaching in our human time. In the liturgy, we discover how seriously indeed the Church considers time, food, rest and all the actions, all the details of our life. In the world in which God became man, nothing can even be withdrawn from Him. Expectation, encounter, possession: in this rhythm, the Church dives and by it, she measures time. But there are days when this expectation reaches its extreme “concentration”; the days of the vesperal Eucharist. The Church has conscientiously and totally dedicated them to expectation and preparation, to fasting in its full sense. They are spent in the same everyday activities, which fill any other day. And yet how infinitely meaningful, how deeply “important” and responsible, are each word that we pronounce in the light of this expectation, each action that we perform! Yes, it is on such days that we are given to realize what is, what ought to be Christian life, we live then as if they were illumined by what is to come! The Eve of Nativity, the supernatural quiet of Holy Saturday, the days of Lent when we prepare ourselves for the presanctified service, how all this should “build up” a Christian soul, lead it to the comprehension of the Mystery of Salvation, to the transformation of life . . . And when finally comes the evening, when all this fasting preparation and expectation are fulfilled in the Eucharist, our life is really taken into this Eucharist, is “related” to the joy and the fullness of the Kingdom. Thus a “rubric” can and must become for us what it was for the Christians in the past, a law of prayer, a law of life.